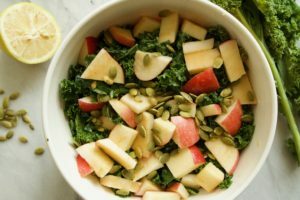 This Tahini-Lemon Kale Salad with Apples is tangy, sweet, and absolutely delicious. The tahini lemon dressing complements the salad very well with its nutty flavor. It is balanced with the sweetness from the apples and the salty crunch from the pumpkin seeds. Plus, this salad is full of minerals and fiber. People will devour this dish at your Thanksgiving dinner. Happy Thanksgiving! 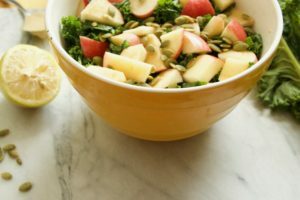 This Tahini-Lemon Kale Salad with Apples is tangy, sweet, and absolutely delicious. The tahini lemon dressing complements the salad very well with its nutty flavor. It is balanced with the sweetness from the apples and the salty crunch from the pumpkin seeds. Plus, this salad is full of minerals and fiber. People will devour this dish at your Thanksgiving dinner. Happy Thanksgiving! Rinse the kale thoroughly and remove the kale leaves from the stems. Discard the stems and roughly chop the kale leaves. Squeeze half of the lemon and add a pinch of salt, then massage it into the kale. Squeeze a little lemon juice onto the diced apples to prevent them from browning. 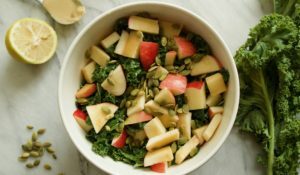 Add the apples to the kale. Place the remaining half of the lemon juice in a bowl with the tahini, olive oil, water, garlic clove, honey and salt and pepper. Mix it well and add it to the salad. Garnish with the pumpkin seeds or any nut of choice and the dried cranberries.